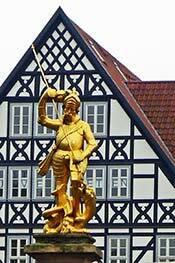 LEFT: St. George, the patron saint of Eisenach, is honored with a gilded statue on a fountain in the Markt that dates back to 1549. Martin Luther attended Latin school in Eisenach for three years, starting at age 15. After being declared a heretic and outlaw in 1521, Luther hid out in Eisenach's Wartburg Castle for 300 days (during which time he translated the New Testament into German and produced a stack of religious writings). Still, Martin Luther isn't the only historical figure whose name brings tourists and pilgrims to Eisenach. The city was also the birthplace of Johann Sebastian Bach, and the Bachhaus Eisenach is a "must see" museum for anyone who appreciates the great composer's works. Eisenach is an attractive small city of 43,000 inhabitants with a well-preserved Old Town, a hugely popular Sommergewinn festival before Easter, a medieval-themed Luther Festival in August (finances permitting), and plenty of sightseeing opportunities to keep visitors occupied at any time of year. Eisenach is also the gateway to the Wartburg region of Thuringia and is on the Rennsteig, a hiking and bicycle trail that dates back to the 9th Century. We recommend spending at least two nights in Eisenach, which will give you time to walk around the center and visit some of the most popular local attractions: the Georgenkirche (where the Bach family were organists), Wartburg Castle, the Luther House, and the Bach House. If you can stay three nights or longer, you'll get even more out of your visit.